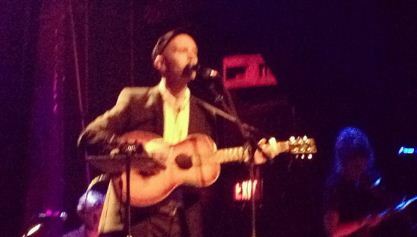 Last night’s Jens Lekman concert was a glorious affair. In town to promote his new, soon to be on everyone’s best of year record I Know What Love Isn’t, Jens Lekman put on a ninety minute show that instantly became one of my favorites of the year. It’s been a long four years since the Swedish singer songwriter last graced our city and there was excitement in the air by the well dressed crowd at the Phoenix. The opening notes of Every Little Hair Knows Your Name started off the show as Jens took the stage with an actual band. The band comprised of a violinist, bassist, keyboardist and drummer. Quickly diving into his new album, Jens rolled off a quick series of songs from his new album which included a charming tale about how the title track came to be. Throughout the show, he would mix up the tracks, combining new and old which included some wicked transitions, including a brilliant one from a new track entitled Golden Key right into crowd favorite The Opposite of Hallelujah, the first song which got the crowd dancing. You can listen to that in all it’s awesomeness at Mechanical Forest Sounds. As a long time fan of Jens, I couldn’t ask much more from the set list – Maple Leaves, Black Cab, Opposite of Hallelujah..it was a greatest hits set. Whether he was performing one of his heart wrenching songs or dancing it up for his lighter material, Jens Lekman was a brilliant performer who captivated the audience with his voice, banter and stage presence. The accompanying band added a lot of depth to the live show, allowing his richly layered music to fully blossom live. My favorite part was the encore performance of A Postcard to Nina which included a hilarious tale of how the song came to be. Such rich storytelling makes you wonder just what the hell all the other singer songwriters are writing about. So to summarize, Jens Lekman plays amazing shows and has amazing records. Definitely check him out if you haven’t already.